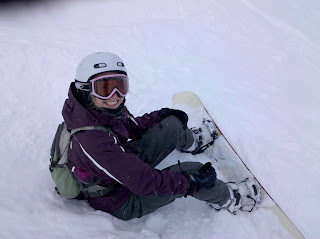 We went to ski-landia this weekend (1/23-24) because it dumped snow with the storms last week. The crew was Marion (shown) and I, Stefon and Elia, Chezo, and Heather. Saturday we went to Squaw and got there early enough to find some of the 14" of powder dropped the evening before (while we were in our 6 hour hell-drive up the hill). We ran all over the mountain and the skiing was amazing. The afternoon ended pretty early for all of us, since we had only slept four hours the night before, and since none of us are in ski/boarding shape yet for the season. Sunday we hit Sugar Bowl, the snow was super nice again and we got to find untouched patches of day-old powder in the trees. There were lots of nice groomies which allowed us to rip until well into the afternoon, as it was pretty much all the muscles could handle after lunch. We drove home Sunday evening and crashed hard! Marion won the weekend for the worst injuries after getting trucked by some jackass teenager who was going 100mph and had 0 control. She's on a strict vitamin I regimen until her neck muscles recover from the whiplash.